Kindergarten is a world of its own. It's about meeting the demands of overwhelming curriculum, and helping children develop life-long coping and social skills. In my school, most of the kindergarteners haven't been to school before and need to learn how to read, write and recognize their name. They need to learn how to hold a pencil and all the while, adjust going to school for a full day. There's no naps and all of a sudden, they're expected to ask before going to the restroom or getting a drink of water. That's a huge change and a lot of new expectations! Lately, as I reflect on what my kindergarteners go through, I'm determined to maximize my time with them, help them feel safe and successful. This means, I need to think of how I can maximize my time to the best of my abilities. One of the ideas I had this week was one I wish I thought of earlier. It's the simplest solution, but one that saves me sooo much time! I used to spend hours per week writing each child's name on their papers in highlighter so kids could practice writing their name. And, now that we've adopted some pretty paper-heavy curriculums, I just don't have the hand-strength to write all those names down for 5-8 papers per day. So, I developed a PDF that is editable. All you have to do is write their name at the top of the paper once, and the other lines are filled in for you. 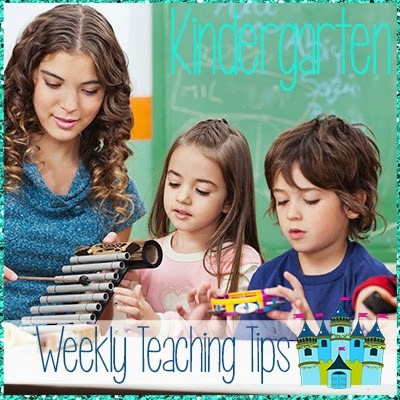 This means there's two lines of dashed-line practice, an open-box format for practicing proper letter formation and an empty line at the bottom for students to write their name independently. I print a master copy of each of my student's names once. Here's the KINDERGARTEN CLUE: I copy them on the back of all of my assignments by using the bypass feature on our school copy machine. For example, I have one folder of all student names printed from the PDF. Then, I print 20 copies of the assignment (I have 20 students), such as a coloring sheet. I feed the coloring sheets through the bypass feature. On our copy machine that means it is face-down and the top of the paper is facing toward the machine. I place the names in the copy machine and make one copy. This prints the names on the back of all of my assignments (coloring sheets). I've created three different name writing PDFs. 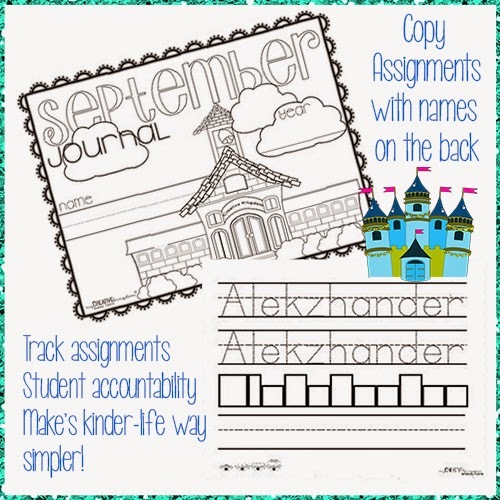 There's a regular-sized print editable PDF for first and last name practice for more advanced kids or toward the end of kindergarten; there's an editable PDF that has a larger font for writing their first name for the middle of the year and an extra extra large editable PDF for the beginning of the year and practice writing their first name. You can find these editable PDFs HERE. 1. If the benefits aren't already obvious, I can tell you that it saves me tons of time from having to write each child's name a million times a day! 2. Secondly, children practice writing their name on EVERYTHING! Most of my children need this extra practice and may not be able to read their own name yet, let alone write it on their own. 3. Thirdly, I don't lose papers! I can tell who has the assignment and I don't have to hunt for who has their assignment turned in and who does not have it completed. This holds all children accountable. In our class, we write in a daily journal and this journal is posted in the hallway on a large brad. The brad holds the journal up and each day or week I add the different journal assignments to the board to keep from having to update the bulletin board throughout the year. This way, it updates itself! Also, by printing the name on the back, you can really see their handwriting progress just in the way they form and write their letters. Since we use Journeys as our ELA curriculum, I can see how their letter formation has changed. We've learned how to write letters A-E. In the beginning, children were writing lower case "a's" in their name by writing a circle and a line. Now, children do it the Handwriting Without Tears (TM) way by writing a "magic c, bump and down!" Now, I can watch them grow and don't have to lose their work!